Court rules against education dept on unsafe school infrastructure - SABC News - Breaking news, special reports, world, business, sport coverage of all South African current events. Africa's news leader. 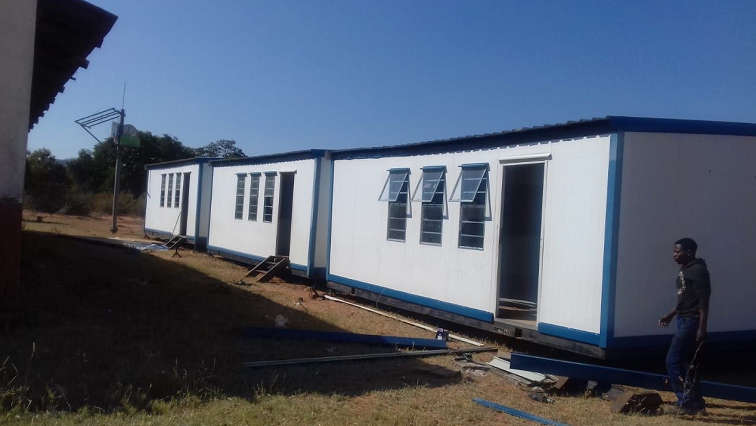 The department of education was ordered to deliver five mobile classrooms and furniture to Makangwane High School. The High Court in Polokwane has ruled against the Limpopo Education Department in a matter involving Makangwane High School in Senwabarwana whose classrooms have been declared unsafe. The School Governing Body went to court after learners spent three months attending under trees in 2018. The department has been accused of ignoring the situation for more than a decade. The SABC first reported on the plight of Makangwane high school learners in June 2018. At the time learners had been attending under trees for three months due to the bad state of their classrooms. A legal battle between the School Governing Body and the Education department was also unfolding in the High Court in Polokwane. The department was then ordered to deliver five mobile classrooms and furniture before the start of the third term, and this was done. There was also an order for a permanent solution to be found by 30 September 2018, which could be either renovating the school or a merger with another school. However, the deadline was not met. The court has now found that the department’s failure to provide a safe learning environment was unlawful and unconstitutional. Rights organisation Section 27’s Shaniece Linderboom, which represents the school, says that they approached the court because of the department’s failure to address the safety conditions at the school. The department wants to merge Makangwane with another school which is 13km away. Parents are against this move and demand new structures. The court has ordered that proper procedure be followed should there be a merger. SGB chairperson Jazz Ngoepe says they want what is best for their children. Spokesperson for the department Sam Makondo says they are still studying the judgement. Section 27 says the judgement is victory for the learners, who deserve safe and decent school infrastructure. The organisation adds that the department has already issued a notice for a merger and hopes proper consultation processes will be followed. This entry was posted on 12 Feb 2019,01:32PM at 1:32 PM and is filed under South Africa, Homepage Latest Stories Slider. You can follow any responses to this entry through the RSS 2.0 feed. Both comments and pings are currently closed.